My Candied Pomegranate quilt, featured in Quilter’s World‘s Feb 2012 issue, is an attempt to “update” the traditional quilt pattern with a fun, sweet and whimsical feel. I used fabrics from Henry Glass‘ Tidbits’ collection to achieve the look I was trying to achieve. 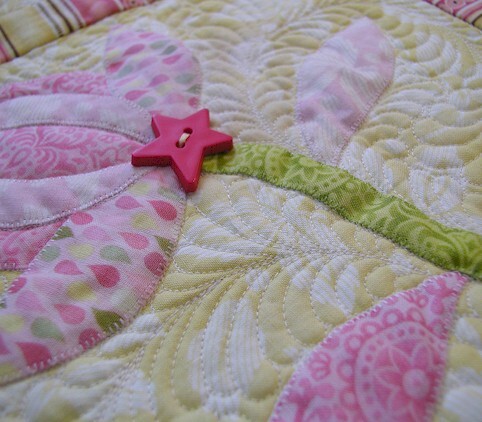 You can see here I used fun star buttons to complete the whimsical look of the blocks. Now to the quilting – I did feathers for the background quilting, and stitched along the applique outlines to give my applique a bit of “pop”. 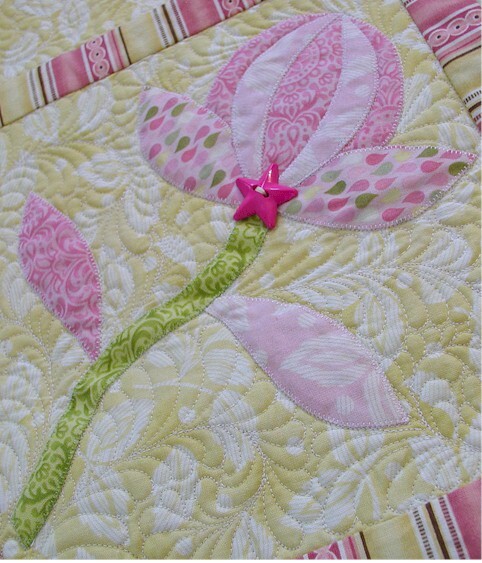 The quilting thread I used is Aurifil Mako 50 Cotton (Color 2310) over Hobbs Tuscany Silk Batt. I hope you liked my Candied Pomegranates as much as I do! :) Thanks for stopping by. Have a lovely weekend. 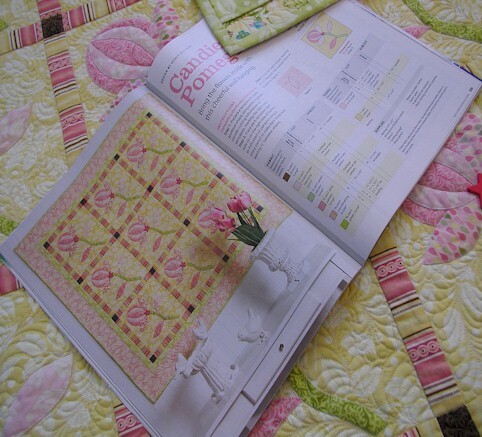 This entry was posted in Quilting, Quilts & Projects: Published, Quilts: Pieced & Applique and tagged Henry Glass Tidbits Fabrics, Pomegranate Quilt, Quilter's World February 2012, Wendy Sheppard Designs. Bookmark the permalink. ← Favorite among the favorites! Love the take on an old pattern and making it mod. Do you know of a good rabbit applique pattern?? I’m completely in awe having seen your Pomegranate Quilt. Completely in awe! I love this, Wendy. It’s the sweetness. Another one on my list to make. You keep me very busy!! It is beautiful – so feminine and soft looking! I like yours best of all. 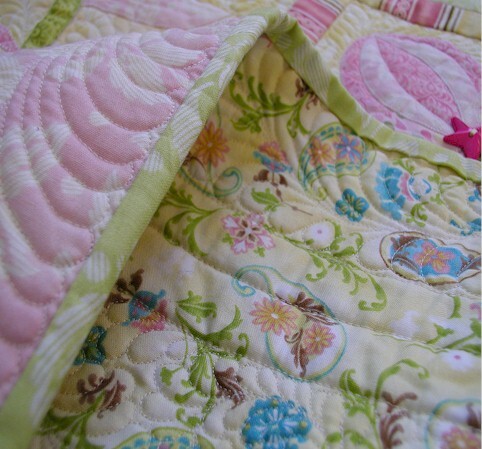 Your quilt is beautiful and the fabrics are so pretty. I’d love to make it. Have a great weekend! What great applique. Cute quilt. Thats my new Favourite. You have outdone yourself this time. Absolutely gorgeous! Of course I love them. Everything you do is wonderful. Your quilting is always excellent. Is it all freehand or do you draw your designs? Your quilt is so beautiful! I have this magazine! 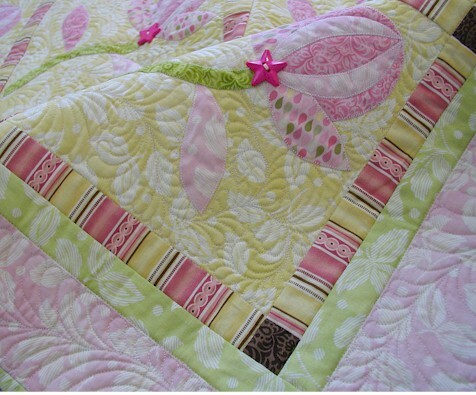 Beautiful quilt and to the quilting is just too lovely. Wonderful design and workmanship! I’m absolutely smitten with it, Wendy! LOVE it! Wendy, what a sweet quilt! I love the break from traditional colors. It would be lovely in a little girl’s room or as a springtime quilt. And as always, wonderful feathered quilting. The black squares and red stars give it just that extra pop of color. Love the striped fabric. I love your Pomegranate’s quilt. I have always loved that pattern very much. Yours is a beauty as are all the others you do. I think it’s a great modern version of a beautiful block! I have the magazine and love that you included it today with close-up pictures. I tried to figure out how you did the feathers in the squares and now I know. Thank you, just another favorite to add to the list. I do like the whimsical look of your pomegranate. The star buttons are so sweet on it too. Wendy, I love it! Just learned how to cut a pomegranate. 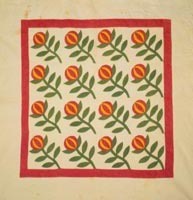 Now, I want to do a pomegranate quilt! I like yours better than the traditional ones. Wendy, you’ve produced another spectacular quilt. As always, your quilting is exquisite! Thanks for sharing this “eye candy”. I love this one. I’ve always enjoyed pink and green together. I really love your candied Pomegrante quilt! 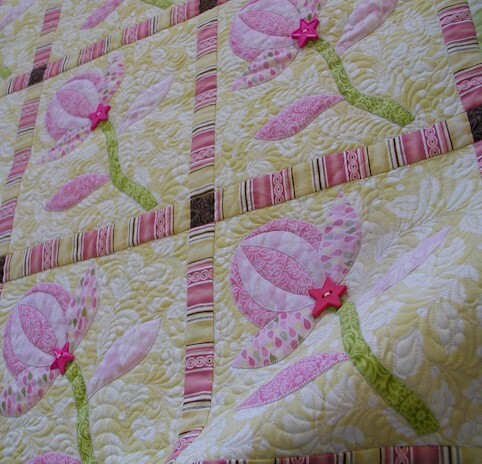 The fabrics are great and the quilting is just beautiful. Well done. The colors are so soft and sweet. Your quilting is just exquisite. I love what you’ve done with this quilt. Wendy, I don’t know how you do it, you take a beautiful applique block and you quilt a gorgeous feather into the block without getting backed into a corner. I am so amazed at your work. I finished a Valentine wall hanging (to be posted yet) and quilted it myself and found myself getting backed into a corner not knowing how to get myself out. Did you draw them on first or free hand them? 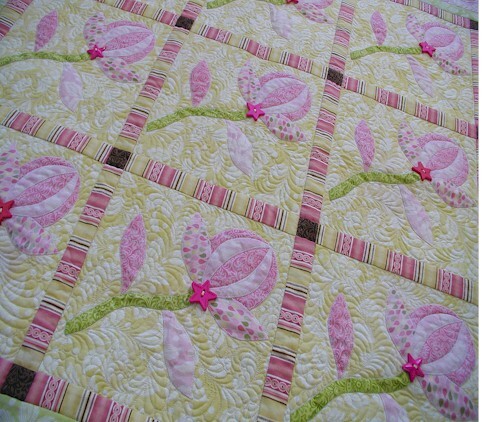 Another gorgeous design with amazing quilting!! VERY beautiful!!! Fantastic! Love the “star buttons” really adds “eye candy”. Hi Wendy…..a friend in blogland told me about your blog; so glad she did. I haven’t looked any farther yet, but def. will….I love your quilt on this post….the applique, embellishments…and especially your quilting….unique….I simply love it!! 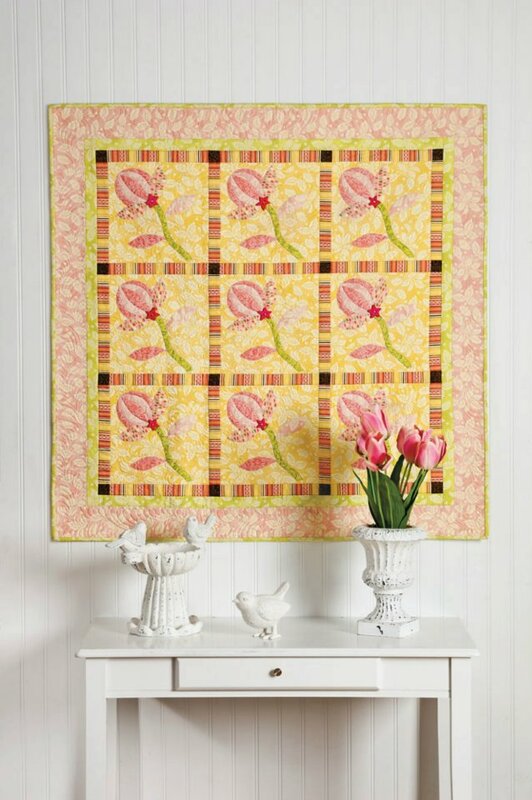 Wow, what a beautiful modern interpretation of an old classic quilt! So soft and pretty. 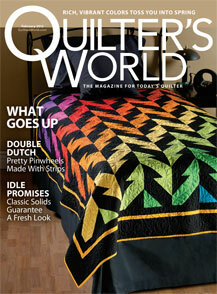 I will be buying this issue of Quilter’s World just to have your pattern. 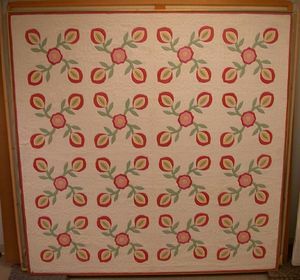 Your updated version of the Pomegranate Quilt is very pretty and the delicate feather quilting sets the applique off perfectly. Love the quilt! 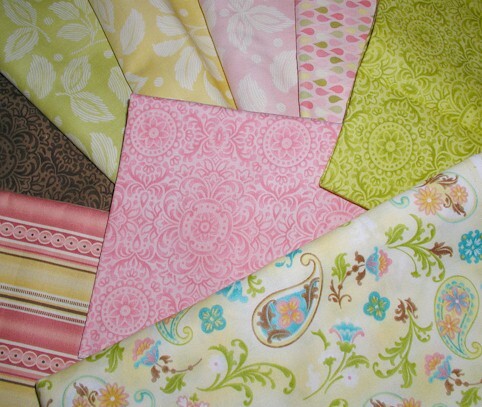 I am just beginning in the quilting world after collecting fabric for years. I have started with the rag quilts but I am quickly moving out of them to much harder projects as I love to sew! S-P-E-C-T-A-C-U-L-A-R ! ! ! I love it! What a sweet quilt. 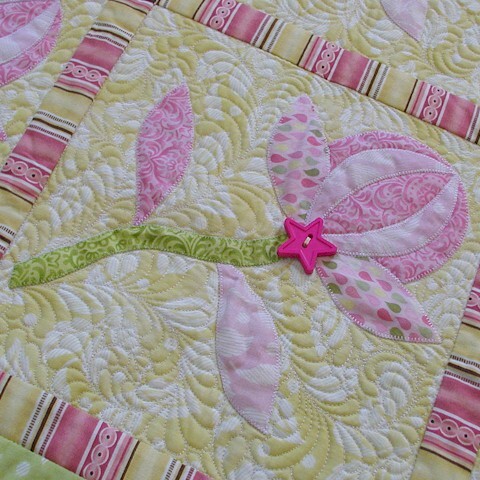 Fun design, beautiful applique’, exceptional quilting. I love it! Every time I look at this quilt my heart leaps. It’s just and awesome quilt. 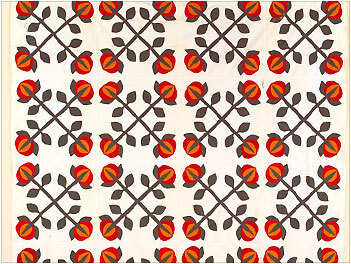 I love your choice of colours for this quilt – Candied Pomegranate. Pink and lime green are my 1st and 2nd choices for my favourite colours! I love this quilt and I love the back.